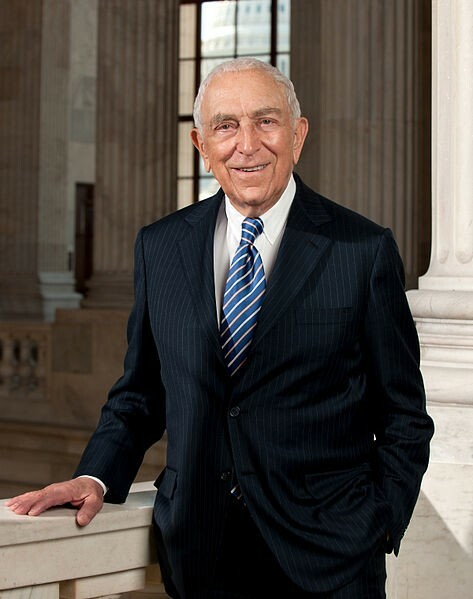 When Sen. Frank Lautenberg, D-N.J. died Monday at age 89, he was in the midst of what was likely his last term in the U.S. Senate. A progressive Democrat toward comprehensive immigration reform, Lautenberg and fellow New Jersey Sen. Robert Menendez, D-N.J., co-sponsored a Senatorial resolution in favor of Hispanic Heritage Month. Governor Chris Christie, R-N.J., has multiple choices when it comes to who he will appoint to Lautenberg's seat and even as to when to hold an eventual special election to find a full time replacement. Garden State law is unclear as to when Christie, in his capacity as governor, must hold a special election for Lautenberg's seat. However, the newer of two conflicting statues indicate it should be on the next Election Day, which would be the day he too is up for reelection, November 5, 2013. Until then, Christie is free to appoint anyone he would like, from Bruce Springsteen or Bon Jovi to his own Lieutenant Governor. While it is unlikely that pop culture Jerseyites will be at the top of Christie's list, many analysts maintain that facing reelection and bipartisan support and criticism combined, the pick must be a well-thought-out, strategic one. One of Christie's closest friends and political allies is State Sen. Joe Kyrillos, R-Monmouth. Kyrillos, 53, who has served in the New Jersey Legislature since 1988, both as an Assemblyman and State Senator. Politico reported that he was the individual who held the Bible when Christie, a Mendham native, was sworn in as a Freeholder of Morris County almost 20 years ago. Kyrillos has good name recognition throughout New Jersey, and could in turn be someone that would have a good chance of running for reelection at the close of Lautenberg's full term in 2014. His politics are also said to be close in-line to the governor's. Another popular Republican name that is likely to be on Christie's short list is U.S. Congressman Chris Smith, R-Ocean/Mercer. One of the more conservative members of New Jersey's Capitol Hill delegation, Smith, 60, has represented the Interstate 195 corridor since 1981. A staunch social conservative, Smith has a history of fighting for the rights of the unborn. But unlike some in the conservative wing, also has had a number of cases in which he has worked to allot Federal money to certain projects. One of those included the Naval Air Engineering Station in his district, just off Route 70 in Lakehurst, N.J., that is popularly remembered as the site of the 1937 Hindenburg Disaster. He reportedly accumulated $50 million in funding thus far for the continuation of the base's operations. In a blue state like New Jersey, a Republican like Smith may enjoy the unique situation that Christie himself is in, in which factions of both parties either strongly support or criticize the officeholder for his ideology and actions, and would make for an interesting electoral bid. A third Republican option for Christie in choosing a successor to Frank Lautenberg would be State Assemblyman Tom Kean, Jr., R-Berkeley Heights. Kean, Jr., 44, represents a swath of central New Jersey stretching from Morristown, over the Watchung Mountains into the Newark suburbs. He is also the son of former Gov. Tom Kean, Sr., R-N.J. Kean, Jr., would be a Republican choice with the heftiest of name recognition, citing his father's former role. Kean, Jr., is currently the State Senate Minority Leader in Trenton. Politico surmised it would also be possible for Christie to choose the elder Kean, 78. However, the report stated that in choosing Gov. Kean, Christie would simply be setting a placeholder until 2014 as they did not believe Kean, Sr. would have interest in reelection. Lieutenant Gov. Kim Guadagno, R-N.J. is another possible choice, as someone who works closely with Christie. At first glance, it might seem a questionable choice for a Republican governor in a blue state looking to possibly change the ideological face of the New Jersey Senate delegation, but some have said that Mayor Cory A. Booker, D-Newark, would be an out-of-left-field, but possible, pick for Lautenberg's interim replacement. Booker, who has drawn praise nationwide for gradually improving the state of one of the United States' most infamous and dangerous cities, Booker succeeded formerly-jailed Mayor Sharpe James, D-Newark, and has since decreased Newark's infamous role as the 'carjacking capital', among other endeavors. Booker has already reportedly been eyeing Lautenberg's seat for some time, after passing up the chance to face off against Christie this fall for the governorship. Leaving only State Sen. Barbara Buono, D-Middlesex, to compete with Christie, Booker's apparent excitement at the prospect of challenging Lautenberg (prior to revelation of his possible retirement) elicited the late Senator to claim that Booker, 44, needed a "spanking" for getting into the race too early. Cory Booker has been seen as a young rising star in state Democratic circles. Should Christie choose Booker, which many say is highly unlikely, not only would it mix up the 2014 race by placing the challenger into the incumbent role, but also show that Christie would be willing to reach across the aisle in major situations, which would bring even more praise and disdain on the governor; considered to be a possible presidential contender in 2016.